`Oumuamua — the first interstellar object discovered within our Solar System — has been the subject of intense scrutiny since its discovery in October 2017 . Now, by combining data from the ESO’s Very Large Telescope and other observatories, an international team of astronomers has found that the object is moving faster than predicted. The measured gain in speed is tiny and `Oumuamua is still slowing down because of the pull of the Sun — just not as fast as predicted by celestial mechanics. The team, led by Marco Micheli (European Space Agency) explored several scenarios to explain the faster-than-predicted speed of this peculiar interstellar visitor. 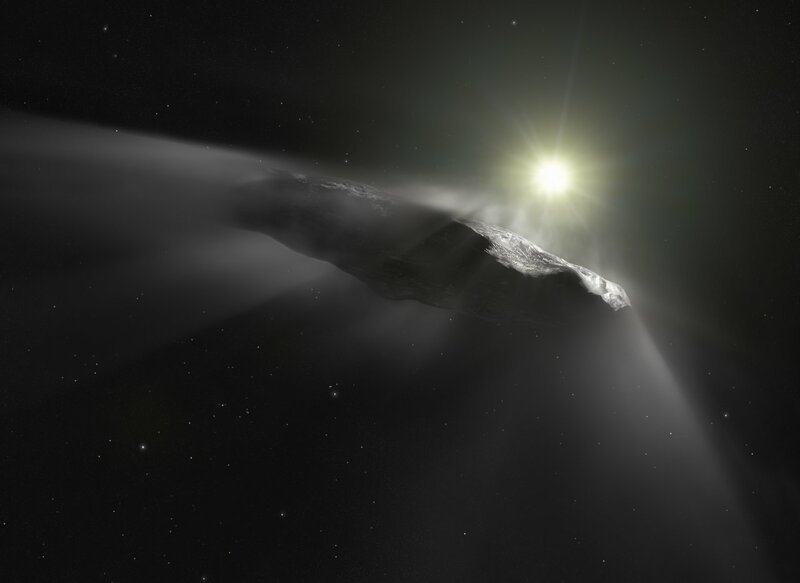 The most likely explanation is that `Oumuamua is venting material from its surface due to solar heating — a behaviour known as outgassing . 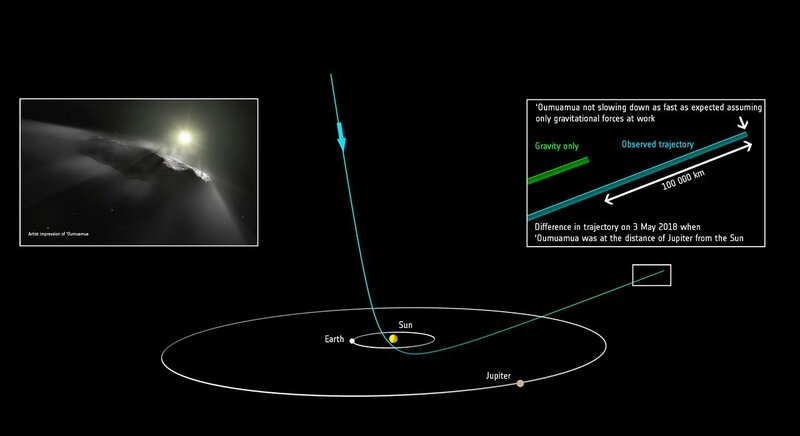 The thrust from this ejected material is thought to provide the small but steady push that is sending `Oumuamua hurtling out of the Solar System faster than expected — as of 1 June 2018 it is traveling at roughly 114 000 kilometres per hour. Usually, when comets are warmed by the Sun they eject dust and gas, which form a cloud of material — called a coma — around them, as well as the characteristic tail. However, the research team could not detect any visual evidence of outgassing. `Oumuamua, pronounced “oh-MOO-ah-MOO-ah”, was first discovered using the Pan-STARRS telescope at the Haleakala Observatory, Hawaii. Its name means “scout” in Hawaiian, and reflects its nature as the first known object of interstellar origin to have entered the Solar System. The original observations indicated it was an elongated, tiny object whose colour were similar to that of a comet. The team tested several hypothesis to explain the unexpected change in speed. They analysed if solar radiation pressure, the Yarkovsky effect, or friction-like effects could explain the observations. It was also checked if the gain in speed could have been caused by an impulse event (such as a collision), by `Oumuamua being a binary object or by `Oumuamua being a magnetised object. The unlikely theory that `Oumuamua is an interstellar spaceship was also rejected: the facts that the smooth and continuous change in speed is not typical for thrusters and that the object is tumbling on all three axis speak against it being an artificial object. The research team’s work is presented in the scientific paper “Non-gravitational acceleration in the trajectory of 1I/2017 U1 (`Oumuamua)”, which will be published in the journal Nature on 27 June 2018. The international team of astronomers in this study consists of Marco Micheli (European Space Agency & INAF, Italy), Davide Farnocchia (NASA Jet Propulsion Laboratory, USA), Karen J. Meech (University of Hawaii Institute for Astronomy, USA), Marc W. Buie (Southwest Research Institute, USA), Olivier R. Hainaut (European Southern Observatory, Germany), Dina Prialnik (Tel Aviv University School of Geosciences, Israel), Harold A. Weaver (Johns Hopkins University Applied Physics Laboratory, USA), Paul W. Chodas (NASA Jet Propulsion Laboratory, USA), Jan T. Kleyna (University of Hawaii Institute for Astronomy, USA), Robert Weryk (University of Hawaii Institute for Astronomy, USA), Richard J. Wainscoat (University of Hawaii Institute for Astronomy, USA), Harald Ebeling (University of Hawaii Institute for Astronomy, USA), Jacqueline V. Keane (University of Hawaii Institute for Astronomy, USA), Kenneth C. Chambers (University of Hawaii Institute for Astronomy, USA), Detlef Koschny (European Space Agency, European Space Research and Technology Centre, & Technical University of Munich, Germany), and Anastassios E. Petropoulos (NASA Jet Propulsion Laboratory, USA).